Venerable Kwang Sheng graduated from the renowned Victoria Secondary School. A devout Buddhist, he was ordained by the well-respected Venerable Hong Choon in 1980, after which, he spent many years studying and practicing in different countries such as Taiwan, Myanmar, Thailand, Japan and Korea. He spent a total of 3 years in Songgwangsa, Korea practicing Zen meditation. In 1995, Venerable Kwang Sheng became the Superintendent of Kong Meng San Phor Kark See Monastery. During his tenure, he generously sponsored many Sangha members for overseas studies. Ven Kwang Sheng was appointed the sixth Abbot of the Monastery in 2004. Concerned with the shortage of learned Buddhist monastics, Venerable Kwang Sheng made preparations to establish a Buddhist College in 2005 while residing at Kong Meng San Phor Kark See Monastery. Since the inception of BCS, Venerable Kwang Sheng, as the Rector, has worked tirelessly, meticulously overseeing both internal and external affairs as well as showing care and concern for the students. He was awarded an Honorary Doctorate Degree in Educational Administration on 1 May 2011 by one of BCS’ affiliated Universities – Thailand’s Mahachulalongkornlajavidyalaya University – in recognition of his outstanding contributions towards Buddhism. 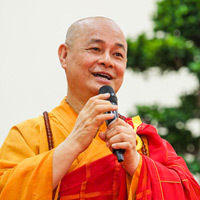 Venerable Kwang Sheng is also an avid Buddhist musician and has co-produced several popular albums such as “Reverence”, “Buddha Smiles”, “Collection of Buddhist Songs” and “Om Mani Padme Hum”.